If you are looking for a really good quality HD video camcorder and willing for it to capture high resolution stills, JVC GC-PX10 is a perfect hybrid digital camera that can fit all your needs. But I would like to mention that, its results shows that it betters suits for recording rather than taking stills. The powerful bunch of capabilities like taking video at 1080p and stills at 12 Mega pixels is a deadly combination and more deadly is the inclusion of 32 GB of internal memory, a feature which is never seen in digital cameras. And more importantly, this hybrid digital camera is priced at approximately 899-999.95 USD ! So here is an Digital Camera Review of JVC GC-PX10 in detail, hope you will like this off topic review from us! The design is quite unique among the category of digital camcorder with the dimensions 2.7 X 5.2 X 4.8 inches with the weight of 1 pound, 3.2 ounces. The model has resemblance with the Sony NEX-5X (699.99 USD) which has thin body, long lens and deep handgrip; although cameras in the Sony series are light weighted where as JVC is bit heavier and it not suitable either for extreme sporty adventure or for safari. Unlike the NEX-5X, you also not be able to change the lenses. 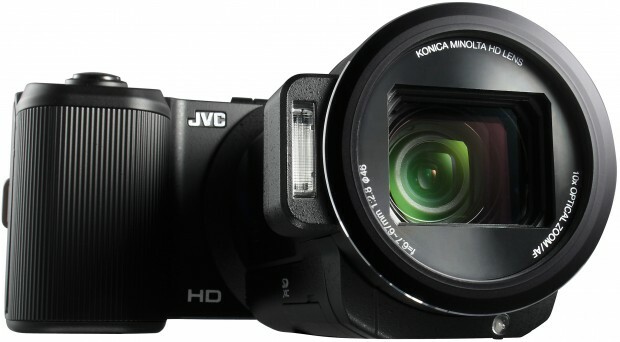 JVC comes with fixed attached Konica HD zoom lens. In video shooting, the lens covers a 43-433mm f/2.8-4.5 field view which is fabulous for telephoto recording but it can be bit limiting to the tight space. The field of view changes when taking still images, which is 4:3 aspect ratios. JVC is also not suitable for wide angle shooting; it covers slight wider 37-374mm range, which is not enough to take group snaps in averaged size room. Compared to this, Panasonic Lumix DMC-FZ150 is a better option for wide angle shooting in the price range of USD 499.99. The lens covers almost 35 mm equivalent view, which makes it capable of capturing nice HD video footage.The rear of the camera equipped with 3 inches, 230k dot touch screen LCD. The menu interface is navigated via touch screen and which make it difficult for the user to adjust settings on the touch screen interface. The camera can be hinged, but it can only be tilted along single axis and in one direction. This allows you to tilt the screen towards your face, but not over the head. Capturing crowded scenarios can be bit difficult due to this . Built in omni directional stereo MIC makes capturing crystal clear audio from anywhere an easy task. You can also plug external MIC through cable, port of which is located under the lens flap. The camera support headphone jack, mini USB and mini HDMI ports. Charging is quite easy and all you have to do is to plug the camera directly power socket for charging. Camera also supports external memory (SD, SDHC and SDXC cards). It almost takes 4.7 sec to turn on, which is quite slow. It is better in terms of shutter lag which is taking only 0.1 sec between pressing the shutter and capturing a shot. It is capable of taking continuously with the gap of 0.3 sec and also support high speed burst shooting. This enables the photographer to capture almost 100 shots in close to 13.1 sec. The camera records 1640 lines per picture height of sharpness and in terms of images noise, the score is 1.5 percent through ISO 800. The video quality is the strength of this camera which records 1080p60 footage at the sampling rate of 36 megabit per sec. the footage is detailed with smooth motion. Files are stored in MP4 format and you can record up to 2 Hrs of footage in the internal memory. If you are mainly interested in video, then PX10 is not at all a bad option, the camera is loaded with extreme features which will enable you to capture fabulous HD footages at 1080p resolution & can release you form hassle of carrying two different devices for stills & HD recording ! Complete Guide - How To Buy Perfect HDTV For Your Home ?